Half the cities in San Diego County delete emails from their servers within the two-year minimum, arguing that they're still operating within the law and that their practice saves taxpayers money. Transparency advocates say governments have made themselves the final arbiters of what is and isn't a public record. 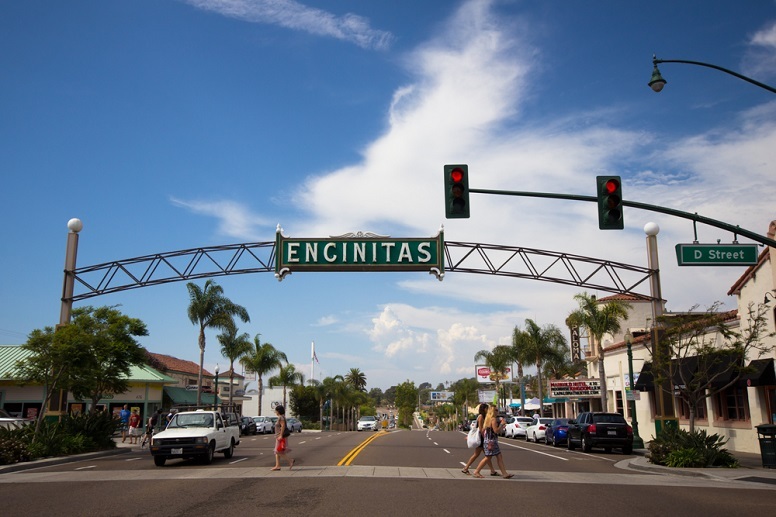 A recent survey by Voice of San Diego showed that Encinitas and Poway have the shortest retention policy, deleting emails after 30 days. Del Mar deletes theirs after 60 days. 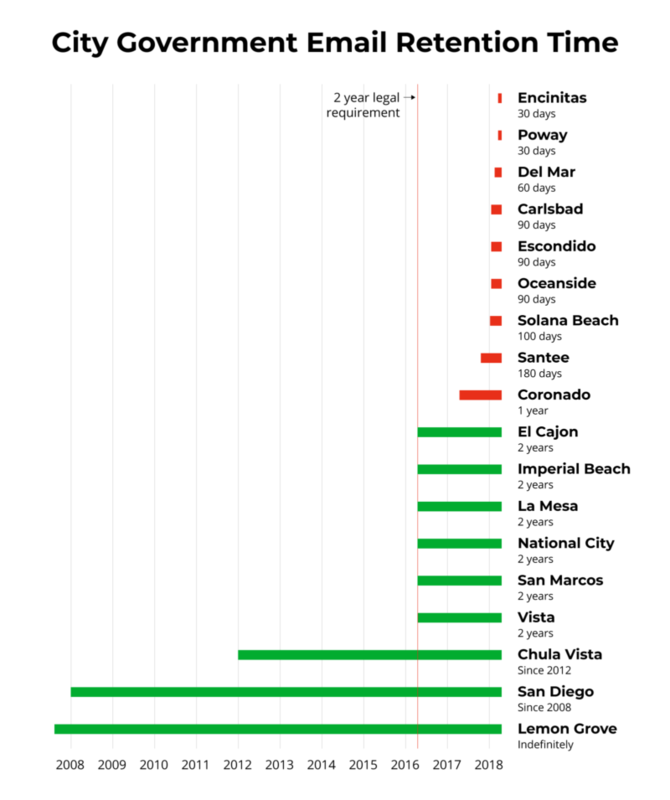 Carlsbad, Escondido and Oceanside wait until the 90-day marker, while Solana Beach waits for 100 days, Santee for 180 days and Coronado for one year. In justifying these policies, city officials argue that the law isn’t as clear on email retention as some would believe and they delete emails they view as non-public records to save taxpayer money. In the process, they’ve designated themselves the arbiters of what’s public and not public — a practice that troubles some of California’s leading open government advocates. “It goes against what state law requires of them,” said Kelly Aviles, an attorney and vice president of transparency group Californians Aware, who reviewed Voice’s findings. Emails in San Marcos, La Mesa, Vista, El Cajon, Imperial Beach, and National City remain on city servers for the required two years, but city staff is still given discretion to delete any emails that they view as non-records. The county’s most populous cities, San Diego and Chula Vista, as well as one of the county’s smallest, Lemon Grove, keep their emails permanently. Due to a city server crash, Chula Vista can only trace their emails to 2012. Because of a database corruption issue, San Diego has access to emails only as far as 2008. San Diego County deletes their emails after 60 days. The California Public Records Act categorizes all emails as public records. Most cities in San Diego County, however, have written policies carving out exceptions for certain types of emails. These policies direct city staff and officials on which emails to save and which to delete. They often abide by categorical lists and retention schedules, labeling emails based on their content. Certain emails are labeled as “city records,” which officials download as an electronic file or print. Other emails are labeled as “non-record,” or “transitory” emails, and are often sent to trash folders immediately. Karl Olson, a public records attorney, thinks that under the requirements of state law, all emails should be saved. “You can’t leave it in the discretion of a city official, what’s going to be saved and what’s not going be saved,” he said. Most cities view getting rid of so-called “transitory” emails as operating efficiently, limiting the costs spent on storage software and information technology employees who must maintain and navigate through the large swaths of data. “The burden is way too great,” Oceanside City Records Manager Thomas Schmiderer said, when asked why the city doesn’t save all emails. Schmiderer said it is a lot easier for departments to navigate through 90 days worth of emails as opposed to two years worth. Tom Coughlin, a storage analyst and consultant said that the cost for storage software is going down by the year. “I would say that it’s easier to store a larger amount of info for less money than compared to the past,” he said. However, he added that the operating costs, managing and navigating the data, still remain as a legitimate factor. San Diego pays approximately $550,000 each year to store and maintain emails. Chula Vista spends $3,599 annually to upkeep their email storage. Edward Chew, the information technology director at Chula Vista, thinks their low cost for storage is mainly due to the older equipment and software they use. El Cajon, whose population is about half the size of Chula Vista and deletes emails regularly, spends nearly $23,000 annually on storage costs. That’s not including the money spent on employees who maintain the data storage. If indeed efficiency is the reason for deleting emails before the two-year minimum, cities are still left to try and justify their policies within the law. Legal arguments for deleting emails stem from a document published in 2013 by the League of California Cities, a statewide association whose membership includes all 18 cities in San Diego County. The 2013 document, which was intended to guide cities on how to handle emails and electronic records, draws heavily from a 1981 state attorney general opinion regarding videotape recordings of city council meetings. The opinion argues that if a video recording of a city council meeting was intended only to help keep written record of the meeting, the video recording could be destroyed at any time, citing its exempt status as a “draft” and not a finalized document. But if the recording was intended to preserve information discussed in the meeting for future reference by the public, the recording should be saved under state law. The authors of the document took this opinion and applied it to emails. “I think that’s a very pragmatic principle that should guide public officials,” said Eric Danly, city attorney for the City of Petaluma and one of the authors of the League guidelines. “Public agency officials and staff receive literally hundreds of emails, sometimes in a single day,” Danly said. “And many of them are only of temporary importance. Some are not even ‘public records’ under the Public Records Act that don’t involve the public’s business.” Danly said that retention statutes in state law never really define what a “city record” is or isn’t. This grey area leaves room for “discretion” and “flexibility” as cities interpret the law, Danly said. As such, cities often use disclosure statutes, governing which records are accessible to the public, when deciding its retention policies. Retention statutes govern what records must be kept and for how long. Cities often argue that if a record is exempt in disclosure laws, then it can be deleted. Such is the case for the majority of cities in San Diego County. Poway’s email retention policy, which draws from the language of a state disclosure law, says that “preliminary drafts, notes, informal communication between staff and consultants, personal messages, announcements, interagency or intra-agency memoranda” are considered non-records and are routinely deleted. National City, El Cajon, Imperial Beach and Santee also rely on similar wordings in their policies. “There’s always been a whole cadre of records that employees managed and made a decision on, whether it is public record by its content,” Diane Gladwell said. Gladwell runs a consulting agency that assists cities with records retention policies. Imperial Beach and El Cajon are among her clients. Gladwell said that if the content of an email does not relate to the public’s business, a city doesn’t have the obligation to retain it and can delete the email when deemed necessary. Californians Aware, and other non-government sources, strongly disagree. Though some emails may be exempt from disclosure under certain statutes, that decision is not one for cities to make, Olson argued. Aviles said that deciding what kinds of records are exempt under disclosure statutes could be a contested and lengthy process. In a landmark ruling in March 2017, the California Supreme Court ruled that emails and text messages about government business on officials’ private devices are public records. The case traveled from the lower courts of San Jose in 2009, then into the appellate courts, and finally the Supreme Court. “Who can definitively, on their own, say what is or isn’t a public record,” Aviles said. Aviles also works as a lawyer for the First Amendment Coalition, an open government advocacy group. In 2016, the coalition sued Los Angeles after requested records went missing from city servers. Last September, Los Angeles settled with the group. The city ultimately agreed that under state law, records cannot be deleted before two years. Olson, who litigated in the 2017 Supreme Court case, said retention policies that empower officials to delete emails may lead to using their discretion to destroy anything that is incriminating or embarrassing. Destroying public records is a crime punishable by a prison sentence under state law. Frank Angel, an environmental attorney said he has been a part of many cases where city emails served as main pieces of evidence. Angel fears that giving municipal employees that discretion leaves room for error. “What if staff makes a mistake? What if an email doesn’t get preserved and it’s lost? People make mistakes,” Angel said. Jonah Valdez is a freelance reporter based in San Diego, but is ready to travel wherever a story may lead. You can contact him via email at jonahmvaldez@gmail.com and follow him on Twitter @jonahmv.